‘Quinnterface’ 32K Memory Upgrade Add-On & Interface to the FreHD Hard Drive Emulator. The “Quinnterface” allows Model 1 users to add 32K RAM to their system without the need for the R.S. Expansion Interface. It also allows for the connecting and easy use of the FreHD hardware, a hard drive emulator. On December 1 J. Andrew Quinn, Bas Gialopsos, and Ian Mavric released the J. Andrew Quinn “Quinnterface” a hardware expansion device for the Model 1. The price is $95- USD. A video on the product was also posted. As some will remember TRS-80.com published a notice back in September 2013, of Wayne Green’s death. Green was instrumental in promoting the TRS-80 by publishing 80-Micro, and Hot CoCo magazines. He also started the publication of many other technical magazines. David Larsen of the recently featured BugBook Museum tells a brief story of how Green boasted he could help fix many problems of the Soviet Union in a planned group trip, and of Larsen’s relief when Green canceled his involvement at the last minute. I don’t believe there is evidence that Green was ever working for the USSR but what more colorful information on a man whose life seemed an adventure. For more of the FBI’s records on Green along with other links on him, see the original posting and the Savetz’ interview page. Dave Larsen, ham call sign KK4WW, runs the The Bug Book Computer Museum site. 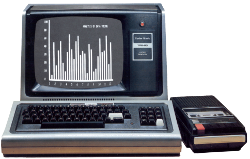 The site includes information on several TRS-80 books. On a related note, Earles McCaul has graciously granted TRS-80.com the privledge of hosting a pdf of TRS-80 Assembly Language Made Simple. Pete Higgin’s of Moreno Valley, CA posted a schematic of the 26-1429 Radio Shack Automatic Power Strip. He offers a modification to use this the automatic power strip on a modern computer system. Of course the original design still works for the TRS-80 so you if you are looking for a retro-project “for your Model II, III, 4, 12 or 16B” you could build (or repair) this one as originally designed. Sean Gallagher over at ARS Technica describes his journey on configuring his Model 100 to view IRC, fetch Gmail and Tweet from BASIC. Links: The Model 100 Goes Online. / Surfing the Internet from My TRS-80. It appears that the main change allows easier for ROM downloading, so that getting started should be easier. Links: Google Play / Development Changelog.